I'm hovering in a makeshift kitchen, watching one of Italy's most eminent marine biologists gleefully playing chef. Prof Silvio Greco is focused on the bubbling contents of a large pot. Dressed up for the part in chef's whites, traditional hat and red apron, the sustainable conservation expert is perfect for the role. "In this water I have put lemon juice and vinegar. After boiling for a few minutes I will plunge it into this ice," he gestures, explaining how the hot water both sterilises, getting rid of bacteria, and destroys the stinging poison. What for some might be food hell has got my tastebuds jumping with curious excitement: we're about to eat jellyfish. For Greco, it's not the first time. "I love seafood," he beams. "Jellyfish remind me of oysters. When you eat them you experience an explosion of the sea on your tongue. They are, after all, 90% seawater." Today he's enlisted the professional help of restaurant chef Marco Visciola, who confesses he's never cooked jellyfish before. He's going to fry it in a tempura batter made of potato, wheat and rice flours, mixed with sparkling water. "No salt?" I ask. "Zero," he tells me. "The jellyfish already has the salty flavour of the sea, so to bring out its flavour I've left the batter neutral." This isn't some perverse chef's challenge, but part of a campaign that Greco is promoting at the Slow Fish festival. Held every two years at Genoa's porto antico the event encourages sustainable fishing and responsible consumption. There are at least four times as many jellyfish in the Mediterranean now as there were in 2004, with global climate change, pollution, and overfishing mostly to blame. And the message this cooking demo is sending out is: if you can't defeat them, eat them. 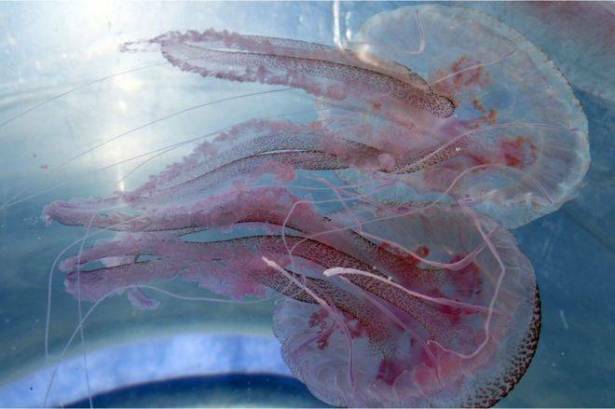 "The sea is full of them and it's a big problem for biodiversity," says Silvio Greco, describing jellyfish as rampant, opportunistic species that immediately take over any empty space in the water. He explains how their spread is devastating marine food chains and ecosystems, and how illegal fishing of natural jellyfish predators like tuna and turtles has left the coast clear for them to multiply. "Now man," he concludes, "must be the new predator of jellyfish." It's an idea the UN's Food and Agriculture Organization is encouraging too. For years, fishermen have been finding their nets increasingly burdened with unwanted jellyfish that they simply throw back into the sea. Silvio Greco hopes this will change and says that sustainability aside, jellyfish is actually good for you: rich in protein and collagen, low in calories, and fat-free.